For a show that was ultimately more interested in plot than laughs, Back in Very Small Business didn’t exactly nail it when it came to plot, did it? Which made a show that was already pretty disappointing as a sitcom – and really disappointing if you remember Very Small Business – into a pretty disappointing dramedy too. 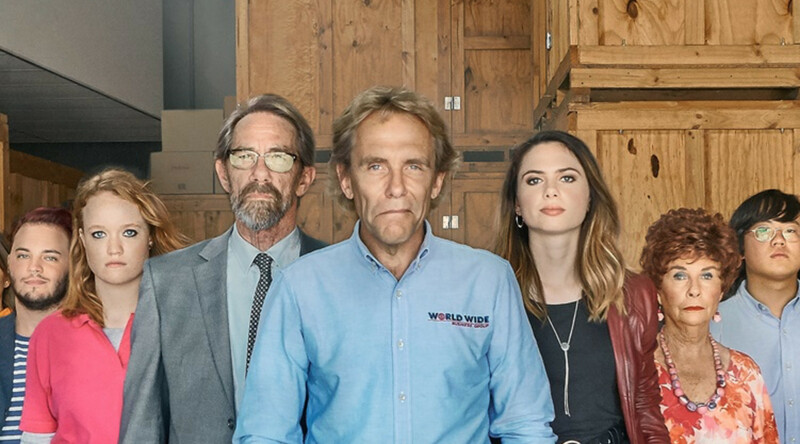 Episode 7 ended on a dramatic cliff-hanger: someone had made a complaint about the Don’s Dirty Dog Wash rooting dogs logo and things weren’t looking good for Angel Family Enterprises (formerly World Wide Business Group). So, episode 8 was about the team trying to save the company – the rooting dogs logo being a principle reason that Don’s Dirty Dog Wash was an actual successful business. Cue one of Don’s trademark rants about how small business is the backbone of the economy and people like him should be allowed to do their thing without government interference…something his staff had the presence of mind to film on their phones, and then post online, where it went viral and saved the company. Hooray! And we know what you’re thinking: that’s actually quite a realistic plot. That kind of thing happens all the time, right? Except, it wouldn’t play out like that in real life for Angel Family Enterprises, would it? Because the other thing that happens in real life is that within minutes of something starting to get traction on social media, lots of haterz, nerds and the occasional legit journalist start picking it apart. And hot on the heels of that ACCC investigation into one of Don’s businesses selling poisonous pineapple rubbers to kids (as seen earlier in the series), how long do you think it would have taken social media to make a link between Don’s Dirty Dog Wash and the pineapple rubbers. Five minutes, maybe? Which would have killed, or at least severely dented, any attempt at a campaign to save the Dog Wash. Because, sure, everyone likes rooting dogs, but quite a lot fewer people are into kids being poisoned by novelty stationery. Or most of the other dodgy things Don Angel’s done in the world of business over the years. Don Angel’s basically a small-scale Alan Bond or Christopher Skase. In real life, he’d have a crew from A Current Affair permanently on his tail, or be in jail. Still, at least it was funny, right? Er…no. Unless you’re laughing every time you see the rooting dogs. And that was the other big problem with Back in Very Small Business, it basically wasn’t a comedy. It had some funny bits in it, and plenty of “wacky” characters, but comedy wasn’t the main focus of the show. There’s not much hilarious in “ex-husband and wife get back together and because they’re well-off baby boomers go around looking for a winery to buy”. That’s a re-working of the plot of SeaChange, a show which was also occasionally funny but is mainly remembered for having a plot and characters that people could get invested in. Good sitcoms can get laughs from their characters that aren’t “this person is an idiot due to their quirk/ethnicity”. And good sitcoms have plots that make sense, which occur or are enhanced by the characters. Back in Very Small Business was disappointing because it had neither of these. It felt like something that was made quickly without the makers thinking it through properly first. Like we said a few weeks back: go watch the original, it was heaps better.